The week is going to start warm, get cool, but then settle out in ‘mild’ territory by it’s end. In true spring form – a strong south breeze will push temperatures well-into the 60s on Monday. Some locations could even reach 70, as breaks of sun become possible during the afternoon hours. Any showers leftover from overnight will be wrapped-up by 9 a.m. Wind gusts this afternoon should range in the 25-35 mph territory; a few could near 40 mph. Tonight will be quiet, as well, but change arrives on Tuesday. Showers and a possible thunderstorm are expected on Tuesday before noon. Then things will start to cool off. Highs will be between 55 and 60 on Tuesday – setting up for a cool down for the middle of the week. Wednesday will be the coolest day of the week with temperatures only reaching the mid-40s. The rest of the week will be spent in the 50s and 60s. 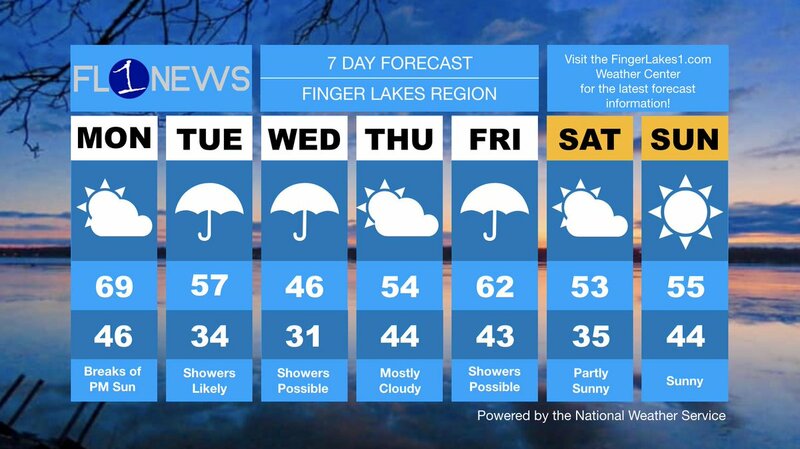 Check out the FingerLakes1.com Weather Center for the latest forecast information.